Butterfly bush is the common name for the buddleja davidii, a species of flowering plant native to China. Not only butterflies are attracted to this bush, as it is a fabulous, striking shrub that even the most inexperienced gardeners will recognize by the long panicles of tiny, colourful and fragrant flowers it produces in August. These flowers contain nectar, which is why they attract clouds of butterflies and other beneficial insects, such as bumblebees. Butterfly bushes make an excellent addition to borders and will even bring your garden to life when most other flowering plants have already shed their leaves or flowers. If you are looking for a beautiful display of colours, there are hardly any hedge plants that will better meet your wishes than the butterfly bush does. As it is necessary to cut a butterfly bush back to about 50 to 60 centimetres of height every year, this species is not recommended if you are looking for a hedge that will provide year-round privacy. 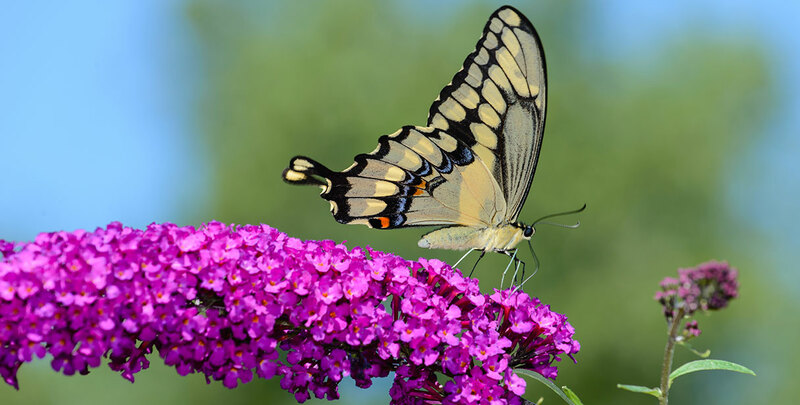 Of course, the main reason people choose to plant the butterfly bush in their gardens is simply because they like the beautiful look of the colourful flower panicles. The common name of this plant is not randomly chosen, of course, and the butterflies that are attracted to these flowers will add even more additional colour to your garden. 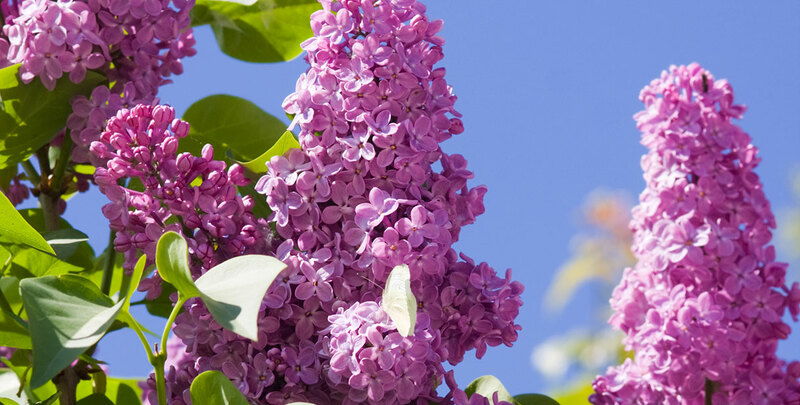 And if its looks are not enough to convince you of the fact that the butterfly bush will bring summer to your garden, the pleasant fragrance of the flowers will certainly entice you. 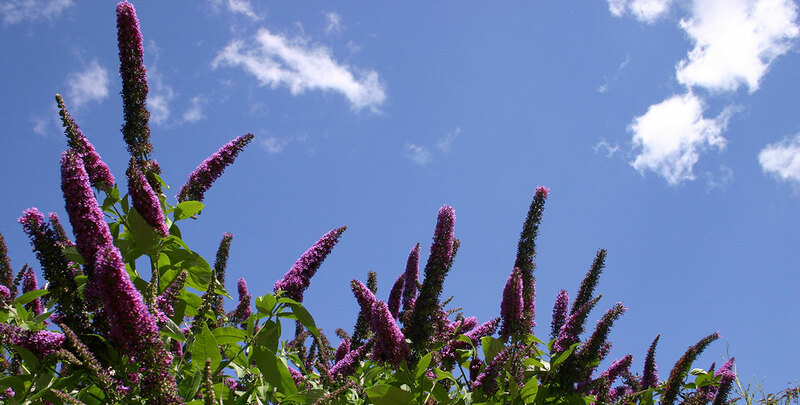 The butterfly bush originally hails from the Sichuan and Hubei provinces in central China, though some botanists have claimed that its history can be traced back to Japan. Today, it is one of the most widely used ornamental plants worldwide and this is also how the plant was originally introduced to the botanical community in Europe. These days, the plant even occurs in the wild in our part of the world, which may be somewhat surprising, as maintaining a butterfly bush requires a certain amount of precision. It has a tendency to grow wild on a dry, rocky soil, while it is unlikely to thrive when planted on a soil that is too moist. The butterfly bush mainly occurs in the wild due to its rapid growth. This growth rate has even caused the butterfly bush to be classified as an invasive species in many temperate regions, including the UK. However, with the proper amount of maintenance and care, it is possible to keep this species from growing out of control. 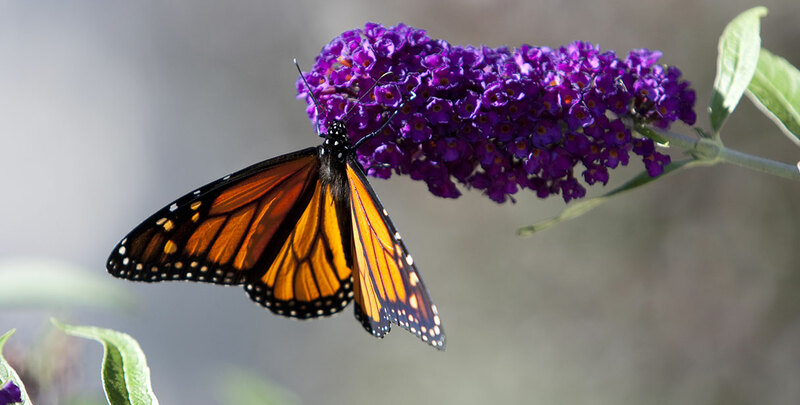 It is encouraged to frequently prune the butterfly bush, as its appearance will be enhanced by the process. In fact, if a butterfly bush is not rigorously pruned every year, there will come a time when the beautiful flower panicles will no longer appear, which would truly be a shame, as these colourful flowers are the main reason why most people choose to plant buddleja in their garden. Butterfly bushes are most valuable as ornamental deciduous shrubs and can be used as free-standing specimens or informal hedges. There are many different cultivars available that are mainly defined by their specific growth habits – either compact or large – and flower colours. If you have a relatively small garden, we recommend you select a compact variety. All cultivars are vigorous, fast-growing plants with an arching habit, reaching a final height of up to 5 metres tall. The butterfly bush is a tough shrub that is fully hardy in the UK, though it does not tolerate temperatures lower than -20°C. The green leaves of the butterfly bush will turn yellow during the autumn months before being shed during the winter. Buddleja make undemanding hedges that will thrive in virtually any soil, including heavy and alkaline (chalky) soils, as long as they are well-drained. A position in the full sun or partial shade is preferred and ideally, the soil should have some nutritional value. Butterfly bush hedges are drought-resistant and tolerate exposed sites. Young wood is the source of new flower racemes, so if you would like to have an abundance of showy flowers during the summer, you will need to give your hedge a rigorous pruning in the spring, ideally removing all of the growth from the previous year. This will encourage new growth and it is the new growth you want. The best time for such a pruning session would be around March. In addition, annual pruning is essential to keep varieties with large growth habits under control, otherwise they will almost certainly grow wild. Deadheading the flowers after flowering will extend the flowering season and will also keep the hedge from seeding, which is normally something you will want to prevent. Other than that, butterfly bush hedges are relatively easy to maintain. There are no strict guidelines on how to prune this species, but they are very tolerant of pruning and as stated before, proper maintenance virtually guarantees that your hedge will regain its striking appearance. If colour is what you are after, there are hardly any better choices for a garden hedge than the butterfly bush. You can simply select the cultivar of which the colour appeals to you most or alternatively, you could combine different colours to give your garden an almost kaleidoscopic appearance during the summer months. And there will be even more colour in your garden by the time butterflies discover your hedge. The butterfly hedge will certainly bring summer to life in your garden.